It is a pleasure to welcome Franz E. Bauer as a guest blogger. Franz led the study that is the subject of our latest press release. He is an associate professor at Pontificia Universidad Catolica de Chile in Santiago, Chile, where his group studies the cosmic evolution of star-forming galaxies and supermassive black holes, as well as a variety of transient phenomena. He completed his PhD at the University of Virginia in 2001, then worked at Pennsylvania State University, University of Cambridge (UK), and Columbia University before finally moving to Chile. Like many discoveries in astrophysics, the subject of our recent study was an act of serendipity. Our large international collaboration had been allocated a series of long observations with Chandra to push the exposure from 45 days to 75 days for the deepest X-ray image on the sky to date, the Chandra Deep Field-South (CDF-S). The primary goal of this project was to explore the poorly understood realm of the ultra-faint X-ray universe, to learn how supermassive black holes form in the early Universe and by what mechanisms they grow to become the present day "monsters" that we see today (for details, see a January 2017 press release led by Bin Luo from Nanjing University and Fabio Vito from Penn State University and an associated blog post by Fabio Vito). However, the leaders of this project, colleagues Drs. Niel Brandt (Penn State University) and Bin Luo, had studied variability from known X-ray objects in the previous data containing 45 days of exposure, and were thus monitoring the individual observations as they arrived to check for large deviations. To our surprise, during one 13-hour observation on October 1st, 2014, a bright, new source emerged (see Figure 1), at a location where no source had been detected, even when summing up all of the previous exposures together. Two days later, in the next Chandra observation, it was gone! We had never anticipated that our observations would capture such a rare, fast transient. After convincing ourselves that it was not some weird instrumental effect, we reported it to the astronomy community as Luo, Brandt & Bauer (2014) in ATEL 6541, to encourage follow-up observations at other wavelengths and gain more clues as to the origin of this unique event. 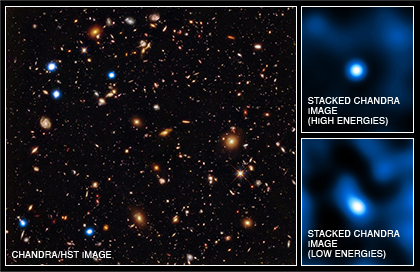 This image contains the most distant galaxy cluster, a discovery made using data from NASA's Chandra X-ray Observatory and several other telescopes. The galaxy cluster, known as CL J1001+0220, is located about 11.1 billion light years from Earth and may have been caught right after birth, a brief, but important stage of cluster evolution never seen before. It is a pleasure to welcome Fabio Pacucci as a guest blogger. Fabio led the study that is the subject of our latest press release. He is going to defend his Ph.D. Thesis at the Scuola Normale Superiore in Pisa (Italy), under the supervision of Andrea Ferrara. During his Ph.D. he spent several months at the Institute d’Astrophysique de Paris (IAP) in France, Yale University and Harvard University in the USA. In September he is starting his first postdoctoral position at Yale University. Fabio has mainly been working on understanding the properties of the first black hole seeds, formed when the Universe was less than one billion years old. It was a sunny and hot afternoon in Pisa when Andrea Ferrara, my Ph.D. supervisor, suggested that I study the first black holes formed in the Universe. This topic is among the most interesting in cosmology. We know that almost every galaxy hosts a supermassive black hole (SMBH) at its center. In the Milky Way there is a black hole about 4 million times more massive than the Sun, but objects up to 10 billion times the mass of the Sun have also been observed. We are happy to welcome Dr. Andrea Morandi as our guest blogger, who is giving us insight into his recent work on using galaxy clusters to investigate the nature of dark energy. Originally from Italy, Dr. Morandi received his Ph.D. in astronomy from the University of Bologna. Prior to his current position as a research assistant at the University of Alabama in Huntsville, Dr. Morandi was a post-doctoral fellow at the DARK Cosmology Center in Copenhagen and Tel Aviv University, followed by time as a research associate at Purdue University. In 1998 and 1999 astronomers discovered the accelerating expansion of the Universe, providing evidence for the existence of the mysterious dark energy driving this acceleration. The same year I started to study astronomy at the Bologna University, fascinated by this major breakthrough in cosmology. I guess my interest for cosmology started from here. Correction: After this paper (Treister et al. 2011) was published and publicized a problem was discovered with the background subtraction used. Analysis by several groups, including the Treister et al. team, plus Willott (2011) and Cowie et al. (2012), shows that a significant detection of AGN (growing black holes) in the early universe can no longer be claimed. This composite image from NASA's Chandra X-ray Observatory and Hubble Space Telescope (HST) combines the deepest X-ray, optical and infrared views of the sky. Using these images, astronomers have obtained the first direct evidence that black holes are common in the early Universe and shown that very young black holes grew more aggressively than previously thought.